A few years ago, I started my own business as a social media manager and blog writer. But I learned very quickly that working alone wasn’t going to get me very far. I actually started my own social media and content marketing agency after I got really burnt out trying to help my clients and doing everything alone. And I as soon as I started hiring other freelancers to help me, that’s when I was able to get my time back and even made more money. Sometimes people don’t realize how much work it takes to really start a profitable social media management business. It can be draining and time consuming. 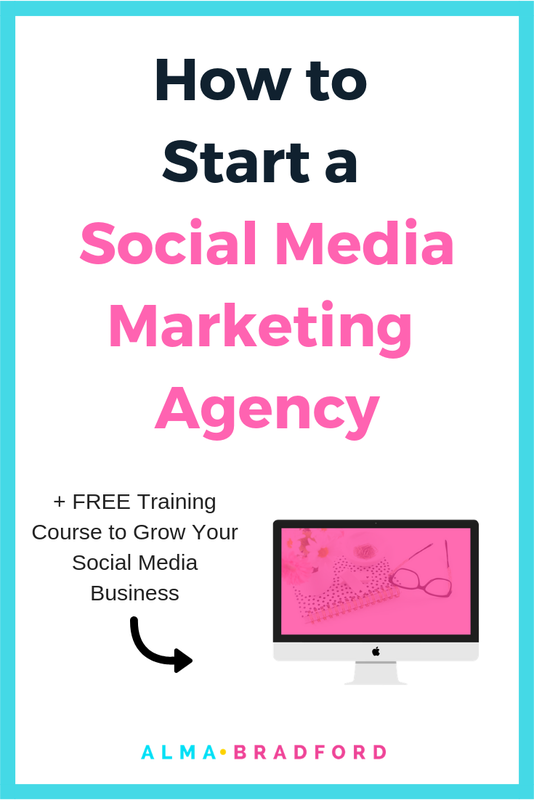 A better way to scale your income and even work less hours is to start your own social media marketing agency. With this type of business model, you can pay other freelancers or virtual assistants to help you do the work. You can also do this from the comfort of your home and work with a virtual team. You don’t even need to hire a lot of people. It truly depends on how far you want to take this. The key is to learn how to outsource your work to the right people. With your own agency, you can take on more clients. You can also hire people who might have more advanced skills that you. If you look at the above list, that’s a lot of work for just one person to do themselves. The solution is really simple: just find people with more advanced skills and become a project manager between your clients and your team members! There might be things that your clients want you to do that you just aren't good at. Like graphic design, Facebook ads or even blogging. This is the perfect time to start outsourcing. Instead of saying "I don't know how to do that" and making your client have to find someone else, you can say something like "I can get someone on my team to help with this". When you outsource, you can still make money by paying your freelancers a portion of the money you make from your clients. You also need time to focus on the activities that will help your business grow. That means focusing on the marketing and sales for your business. This can include networking with potential leads online, attending networking events in person, sending out a weekly newsletter to your email list, or writing blog and social media posts. All of this takes a lot of time. If you outsource your social media work, you’ll have more time to make sales and increase your revenue. Instead of spending 12 hours a day doing client work plus finding new clients, you could be spending that time with your family, or traveling or just taking a nice walk outside. Think of all the things you would like to do in your free time. You can't do this if you are constantly working. When you have other people working with you, you can take more vacations and travel. That is really why you started your business in the first place, so that you had more time and flexibility. If you are working full-time, this is the perfect time to start outsourcing. Because you are working for 8 hours a day and you don’t have the time to do all the client work plus find new clients. I was in this same situation while I worked full-time and used my side hustle to pay off my debt and save money. You can use your time after work to find new clients, hire other freelancers and then just do the project management of this whole operation. You can make money on the markup price. You might not make as much money since you are paying a portion of it to someone else, but once you have multiple clients, your earnings will go up. You need to make sure that your team is made up of the right people. Think of your subcontractors (the people who you outsource to) as your team. Treat them as such. Establish a good working relationship with the right people. Let’s break down what each of these points mean. The most important thing is that they have the skills to carry out the work. You need to interview each potential new team member and make sure they can do what they say. Check their portfolio of work and see if they have testimonials from past clients. You can also give them a small test to see if they can actually do the work before hiring them. You should also interview them. This can be done through email, Skype, Facebook messenger or a regular phone call. This is the second most important thing after having good skills. If they are difficult to work with, do not respond to your emails, and are unprofessional then it doesn’t matter what skills they have because you won’t be able to work with them. If you pay them and they disappear or they are dishonest, this is a real problem. You will need to take some time to see what type of work ethic they have. After you are working with people on a few projects, you can make a determination and decide if you can trust them. After you are working with people on a few projects, you can make a determination and decide if you can trust them. You also need to be able to work well with them. So there has to be a good personality fit. You can find this out by having a real conversation with them during your interview and also as you work on small projects with them. Sometimes you will have to work with a few people to determine who you can really add to your team long term. The problem that I typically see with social media managers who have virtual team members is that they don’t understand basic communication concepts and what motivates people. You see its simple, when you are not face-to-face with someone you have to explain things to them visually and orally. You can’t rely on just emails or tasks that you add to an online tool like Trello or Asana. What I found that helped us the most was just picking up the telephone and having a real discussion with my team. Don’t fall into the trap that many online business owners fall into when they only rely on email, Slack or some other IM tool. Humans need to connect with each other. The only way you can build a winning team for your Social Media Agency is to really create a relationship with your team. The other thing you need to do is to be very specific when you give your team instructions. So this means using screenshots and videos to explain what you need them to work on. You can hire other freelancers on sites like Upwork, or you can hire college interns. Facebook groups are another place where you can find people. The most important thing you need to do is to write a very clear job description of the type of person that you are looking for. What your company is about and the type of work you do. A way to contact you: your email address or a link to your contact form or an application page on your website. The title of the position you are hiring for. A list of tasks that the person needs to do. Skills or tools the person needs to know. Working conditions - will they be able to work from home? How many hours per week? Are there specific times of the day that they need to be available? This job description needs to communicate exactly what you want this person to do so that you can attract the right people. After you get some people applying for your position, you should also setup a phone interview to see if they are a good fit. You want to check for professionalism and good communication skills plus knowledge of the work you need them to do. I actually have a free guide that shows you how to get started as a social media manager. Download it here.